This article is about the character. For the guest star, see Tom Hanks. Tom Hanks is an Academy Award-winning American actor. When Lisa tried to solve who the person behind a silhouette was, with the name "Mot Hanks", she thought it was easy as it was obviously Tom Hanks. The answer, however, was Otm Shank, a shuffle of "Tom" and "Hanks", respectively. Lisa then asked who about he is. He appears in a commercial informing viewers of a new Grand Canyon, which would be located where Springfield is. He later appears in the credits, saying "If you see me in person, please, leave me be." A picture of Tom Hanks was seen on the wall of Springfield Sardi's. 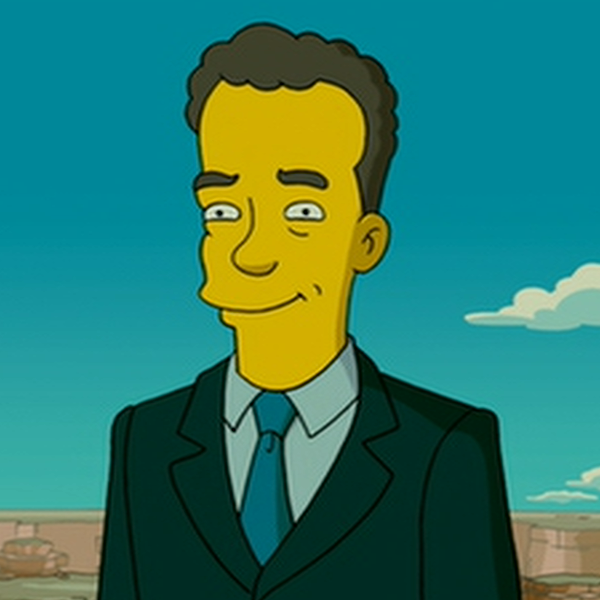 Marge mentioned Tom Hanks as one of the actors who went from comedy to serious acting to Krusty. Lenny referred to the love story between Moe and Anastasia Alekova as the kind of movie they wished Tom Hanks would go back to making. Homer then asked "how many captains can one guy play?" Modified on November 12, 2018, at 17:24.